Earlier this year, CMA CGM announced a new product: REEFLEX. It’s a single-bag flexitank suitable to be installed in a 40ft reefer container with a capacity ranging from 12,000 to 24,000 liters. What does this mean for the flexitank industry? Bruno Silva, Managing Director at BeFlexi, was interviewed by World Cargo News to give his thoughts. 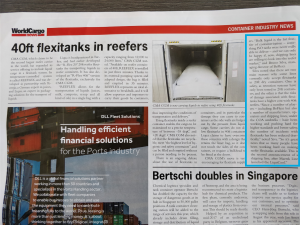 “Bulk liquid is the last frontier of containerisation – something ISO tanks were never really able to deliver – and we can only be happy if, now, shipping lines are willing to look into the reefer market…there are two main reasons why some lines currently only accept flexitanks in 20ft dry containers. One is safety, as retention systems have only been tested in 20ft containers, and the other is that the risks of damage associated with flexitanks have a higher cost with 40ft reefers. To read the full article, head over to World Cargo News.